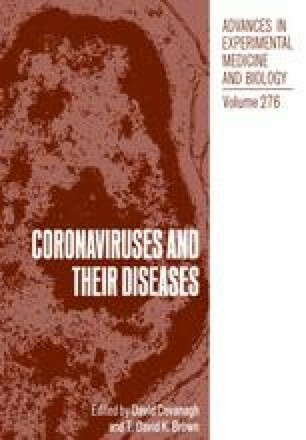 Coronavirus MHV-JHM has two surface glycoproteins. The S protein is a heterodimer comprised of two non-covalently bound, subunits of about 90,000 molecular weight (mol.wt.) (S1 and S2) which are derived by proteolytic processing of the 180,000 mol.wt. precursor S. Multimers of the heterodimer assemble together to produce the characteristic peplomer structures at the surface of the virion. The second surface projection is smaller and is comprised of disulphide-linked homodimer(s) of the HE protein. The reduced HE monomer has a mol.wt. of 65,000 (Siddell et al., 1981).